Q. I'm a foreigner who wants to tour the states in an RV I would purchase there. Clearly I need vehicle insurance for which I first need - correct me if any of the following is wrong - a US drivers license. To obtain a drivers license I need to declare a place of residence in the US, which I don't have. I don't know anyone in the states whose address I could use. Any suggestions to resolve this problem? A. Drivers licences are only issued in the country (and state) where you live. You do not need a US drivers licence to drive or rent a vehicle (or RV) for a short term in the USA but I believe even a long-term rental would involve some red tape. And I think purchasing will definitely be difficult. You are correct that insurance will be an issue and, without a permanent residence in the country, you will also have trouble registering any vehicle (to get a licence plate on it). Even if you knew someone in The States, you cannot legally use someone else's address to register a vehicle. 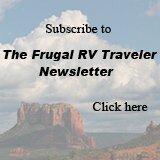 A reputable RV dealership in the USA (one who thinks they may be able to sell you an RV) may know a way around this. I would contact a few and see what response you get but be sure to double check their advice to be sure it's right. Better still, contact US customs at http://www.cbp.gov/ to ask if there's a legal way around this. I'm sure business people or students who are in the country for years would qualify for a special visa that may allow it - but they would likely have an address while they're here - perhaps there's a tourist visa that would qualify. You might also contact the RV Dealers Association at http://www.rvda.org/, or the RV Owners Association at http://rvoa.com/. One of these organizations may have an answer. We often meet foreigners who have actually brought their RV with them from Europe - perhaps the red tape involved in buying here is part of the reason. If any of my readers has dealt with this or have advice, I invite you to please respond. Comments for RV insurance for foreigners? Montana is the "Safe Haven" for RV's in US. First, they have no sales tax if you buy one here. 2nd, and of relevance Montana allows you to own your RV in an LLC. ie, A separate entity. YOU do not own it, but your LLC does. Therefore, your entity will insure your RV in Montana. LLC will have a "registered Agent" for mailing and forwarding rv related info. YOU become an authorized driver of the rig. I have done this successfully, and there is a little cottage industry in Montana doing this. I used Deer Creek Services, google them. If you talk to them, tell them Rick Bowles referred you. Hopefully they will give us both some sorta break! Happy trails! I can imagine one of the main reasons to consider buying would be the cost. Renting is fine for a few weeks or a month but, when traveling a whole year, the costs would be extreme - even with a discount, by the time you pay for mileage, there will be few RV rentals for less than $800. to $1000. per week. I'm under the impression there would still be some red tape (a travel visa of some kind) to rent legally for that length of time. We live in a U.S. territory and faced the same challenges. There are companies in South Dakota that provide a stateside address for RVers and will register your vehicle there. The vehicles do not have to be inspected. I'm not sure how this would work for you but it seems like it would be worth looking into. We are on our way to the airport to fly home from a camper trip but when I get home I'll look up the name of the company. There are several. As to why not rent, if you are planning an extended trip, the price would be astronomical. Many, many thousands of dollars plus mileage if you can't get a deal. Deals with mileage are hard to find in the United States. I speak from experience on this because we rented several times. The last time we rented, we did it in Calgary and drove back to the U.S. because it was a much better deal. Why not rent one? I see rented camper vehicles on the road all the time. The insurance would be part of the rental agreement.